Armed with only a tiny shovel and small gold pan a brave bearded prospector finds a gold on an amazing black sand beach on Lake Superior worth millions. The “Black Gold” is really black sand (iron rich particles) which contains tiny pieces of gold and stretches for miles along the largest lake in America. The lake is so big that it reacts to the moons pull similar to “waves” in the oceans of the world. These waves move the very heavy black sand into bands along the beach where the even heavier gold flakes also settle. Black sand is common on many beaches in the world and probably the most popular is the beach on the very popular TV show “Bearing Sea Gold” however there are beaches in California, Oregon and Washington. Although black sand has little value to a prospector it is what one looks for to indicate gold since they are both very heavy. 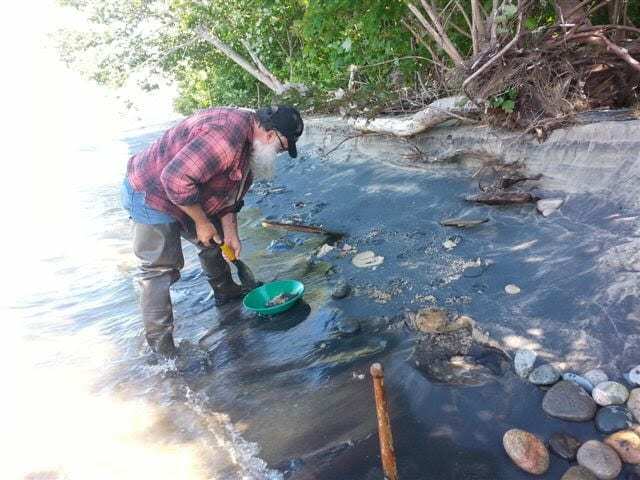 “This changes everything!” the bearded prospector proudly announces “There is enough gold on this beach to pay off the national debt!” as he scoops another small amount into his plastic gold pan. The prospector plans to return every year until he can buy a Gold Cube and a matching “Trommel” which is a tubular device with holes. As he puts it, “With a Gold Cube I can work as hard as I want without having to stop even for lunch”. A Gold Cube is the choice of many prospectors who want to work hard yet get filthy rich at the same time.